The Vijnanabhairava is one of the scriptures revered by the sages of Kashmir Shaivism. This Sanskrit text consists of 112 dharanas, or centering techniques, revealed by Bhairava, Lord Shiva, to his consort, the goddess Bhairavi, also known as Shakti. This dharana will support you in focusing your awareness as you enter meditation. 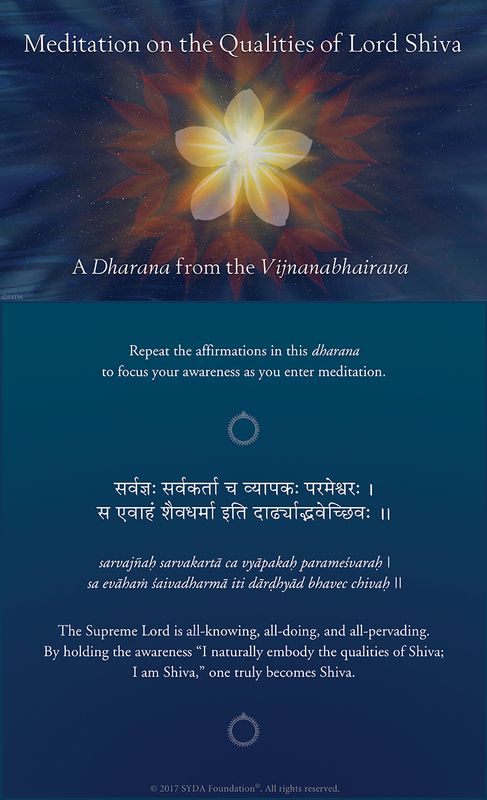 Vijñānabhairava 109; English rendering ©2017 SYDA Foundation. After a challenging week, I noticed the words “I am Shiva” arising spontaneously and unexpectedly from within. My mind shifted into an easeful state, and I was able to pause for a moment to connect more deeply to the experience. I asked inwardly, “What does Shiva experience?” Then, I sensed a golden column of light, solid and flexible, and very tranquil. I rested in this expansive awareness. An inner knowing that I am whole and complete arose. Now, seeing this dharana , I am reminded of this exquisite experience. I feel blessed and in awe of the power of the Siddha Yoga path. I am grateful for the love, affirmation, and synchronicity I experience. After I chanted this verse for a while, I started seeing golden light gradually going upward with each inhalation, and washing away delusion with each exhalation. The Shakti was creating a beautiful dance of Shiva with the rhythm of my breath, under the golden light. I witnessed that my sense of "I" was vanishing in that Shiva-Shakti dance, and there was left just that beautiful golden-light dance. It was an amazingly peaceful meditation. It gave me a sense of merging into Shiva, coming to nothingness, yet feeling a sense of completeness! Thank you very much, Gurumayi ji, for the grace that made this possible. I feel very blessed to hold this awareness. When I started to focus carefully on reading the text of the dharana, my breath instantly became deeper. The words all-knowing, all-doing, and all-pervading penetrated into my mind. An image arose of birds resting on a large meadow after a long flight. It felt as if the words and the image had filled up the space within my mind, while still leaving room for a deep inner silence. In this silence, everything dissolved. I became absorbed in the experience of inner space, and Om Namah Shivaya filled my heart.